Forget all about clean lenses and smooth photographic surface. 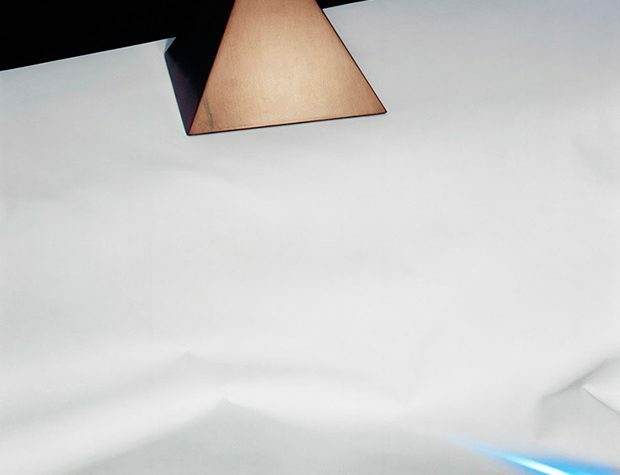 This collective, experimental exhibition, showcasing the work of sixteen artists brought together by curator Karsten Lund, is homage to raw materiality. Phantoms in the Dirt, currently at the Museum of Contemporary Photography, is an invitation to rethink and re-appreciate the forces of nature; at the same time proving that finding the beauty in dirt, dust and debris of all kinds, dares to change the future of the photographic image. Spanning three floors of galleries, this exhibit brings together photographs and sculptures that negotiate the visibility of invisibility, literally as well as figuratively. Films exposed to the elements, an old, dirty iron barrel with obvious signs of rust, insects smashed on the windshield while driving across the country –beneath the dust, what phenomenically feels like a landscape in ruins, is giving documentary photography a new purpose and aesthetic value. Matthew Brandt photographs lakes and reservoirs. Then he lets the natural phenomena into his photo-making process. 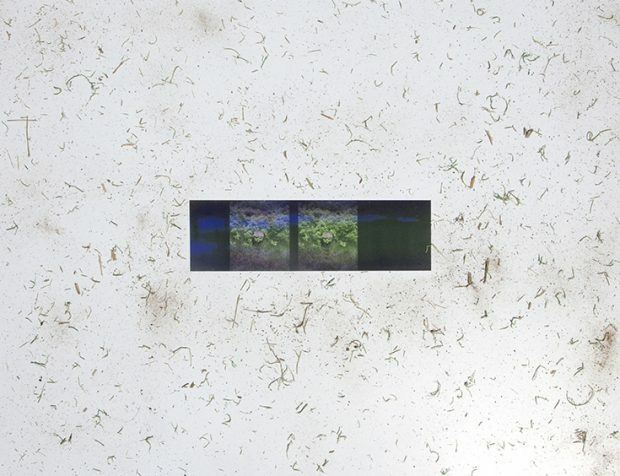 Exposing his pictures to the elements of nature, he soaks prints in water from the specific lake depicted, as if he’s trying to give them an essence of their original substance –a long-delayed homecoming. In the intersection between the artificial and the natural, the phantasmagorical landscape of Gray Lake, ID 7, 2013, looks splattered with red paint. The artistic outcome, however, is something deeper striking colors over natural landscapes. In a far, dark corner, Alison Rossiter showcases works made exclusively in the dark room while experimenting with long-expired photographic paper, mold, and the natural deterioration of elements. In sepia tones, her photographs juxtapose the physical and the spiritual, as the blurry line of the horizon blends with the clouds like apparitions creeping in the shadows. Shane Ward’s, rusty barrel and found objects, have the same dramatic effect as Joachim Koester’s grim vistas of a deserted, rural scenery (The Barker Ranch, 2008) proving that the artworks are irrefutably interacting with one another. So far the exhibit is mostly black, white and sepia. 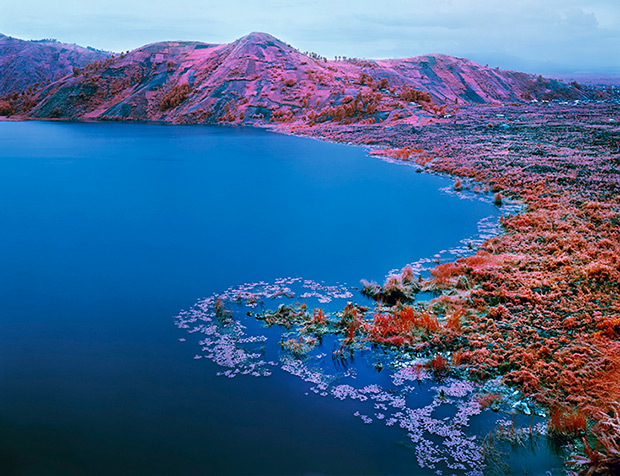 All until Richard Mosse’s undeniably trippy exposures (Beaucoups of Blues, North Kivu, Eastern Congo, November 2012, 2012 and Sugar Ray, 2012) turn the by-product of an infrared film into a surreal reality, where the outlandish scenery consists of skies, and trees, and mountains, all in bright pinks and blues. The exhibition character largely derives of the cult of the ruins but, in reality, in Phantoms in the Dirt, much of what looks ruined is actually reconstructed. Either due to a camera glitch or nature’s interference, either in a pink, dreamy, fantasy world or in a soulless, enigmatic scenery, the viewer immerses into the dirt, the dust and the material world in its simplest form –the ground that we stand on.